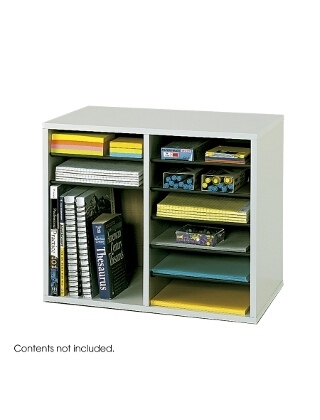 The design of the adjustable organizer is perfect for desktop storage of letter-sized materials. Shelves are adjustable or removable to customize individual compartment size. Includes 10 hardboard shelves that form up to 12 letter-size compartments. Constructed of compressed wood with laminate finish and solid fiberboard back.